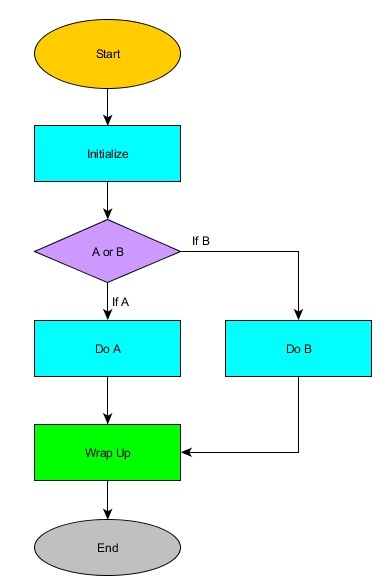 Engineers (maybe programmer too) like to use flow chart to illustrate the processing flow and I'm one of them. However, it is very hard to find a free user friendly software to draw the flow chart. So most of the time, I'm using Microsoft Word to draw the flow chart which is totally not effective at all until I found this free "yEd Graphic edtitor" by yWorks which was recommended by one of my colleagues. Once you you have tried this software, I"m sure you will throw away others because it is really very user friendly and very convenient to use. What I like about this yEd Graphic editor? Yeah, of course it is FREE. The main reason! Draw any shape easily. You can drag and drop the box that you would like to draw. Re-size the shape as you wish. To redraw a similar box, you can just do copy and paste. Draw arrow easily by clicking and holding the box and moving it to another box. Just try it yourself, you will know what I meant. Enter text in the box by just double clicking the box. Auto show the line to tell you whether your boxes are aligned with the rest. It shows you both edges and middle lines of the of box when you move around your boxes. Change the color in the box by "property view". Just click on the box, you will see the property view, then you can change a lot of stuff there, not only the color! Enter label besides the arrow by just clicking the label, you will then key in the label text that as you wish. After that, you can also move the label to few predefined positions of the arrow (e.g. upper left/right or lower left/right). Very user friendly! Those are the simple one and I believe you can do more fancy stuff with this software. But for these tips above, I think it is good enough for majority of the people. Enjoy!